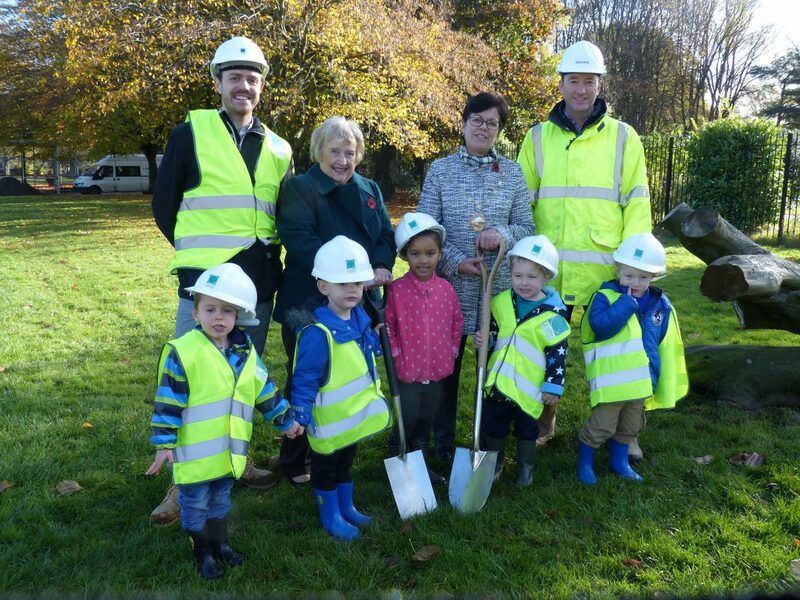 A turf cutting event was held at Page Park in Staple Hill to mark the start of building work to create a new café and community building (Wednesday 9 November). Enhancements to the popular park have been made possible thanks to a Heritage Lottery Grant of £1.6million, and further funding including council grants, which bring the total to £2.2million. Cllr Erica Williams, Chair of South Gloucestershire Council, was joined by Environment and Community Services Chair Cllr Heather Goddard and children from Page Park pre-school nursery along with some of the volunteers from the Friends of Page Park who were on hand to help with the ceremonial turf cutting. Cllr Erica Williams said: “This is a historic milestone for Page Park and all the people who have worked so hard to bring their dreams to a reality. All those involved should feel very proud that their campaigning and fundraising to restore and refurbish the clock tower and tennis pavilion and provide a community building and café has brought them here today. Work on the new combined café and community building, which will serve as a hub for the park and local community, is now underway and is expected to be completed by June 2017. Other improvements to be made during the five-year refurbishment project include the clock tower restoration, restoration of the tennis pavilion, resurfacing pathways, new gates and railings, a programme of activities and training for volunteers.